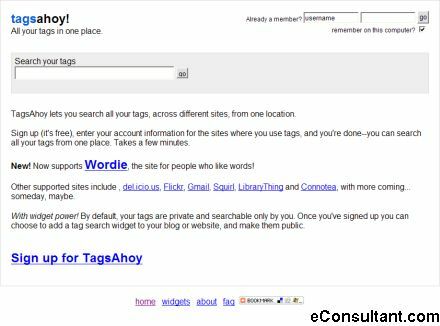 Description : TagsAhoy lets you search all your tags, across different sites, from one location. Just sign up, enter your account information for the sites where you use tags, and you’re done, you can search all your tags from one place. Supported sites include del.icio.us, Flickr, Gmail, Squirl, LibraryThing and Connotea.